Theism and Humanism is the first of two courses of Gifford Lectures delivered by Arthur Balfour at the University of Glasgow. The printed volume represents an expanded and slightly modified form of the original lectures, which per Balfour’s customary style were delivered extempore. In the book, the ten lectures are spread over four main parts. The first two lectures comprise the introduction; the third and fourth lectures form Part 2, which is entitled ‘Aesthetic and Ethical Values’; the fifth through the ninth lectures form Part 3, which is entitled ‘Intellectual Values’; and the fourth part consists solely of the conclusion. The whole course of lectures seeks to show that the very best of humanity, whether aesthetical, ethical or epistemological, requires God for its support and as its source of value. In his first lecture, Balfour sets the stage for his project, by establishing his agenda to explain metaphysics in terms which can be easily understood by the ‘plain man’. He wishes to advocate a type of Divine Knowledge (that is, knowledge of the Divine), which is both intimately philosophical and intimately scientific. As such, his is a mode of discourse that bridges philosophy and science in order to clearly and, insofar as it is possible, non-technically explore the nature of the metaphysical. In his second introductory lecture, Balfour debates the possibility of design and selection within the evolutionary process, a point he regards as bearing specifically on the possibility of belief in the metaphysical in an age of science. Though the argument from design is deemed tenable in light of Darwinian evolutionary theory, Balfour acknowledges that design only goes so far towards the creation of a ‘religious theology’. For Balfour, a theism which is worth centring a religion around requires not only a design inference, but also a set of values, a knowledge of the good, and a framework for reasoned thought. This, he argues, comes not through an analysis of nature, but from an examination of the human mind and the ‘soul of man’. In his third lecture, ‘Aesthetic and Theism’, Balfour takes up the problem of values by reflecting on the inner emotional life as it pertains to the aesthetic experience of the beautiful and to the sense of value which arises from objects of aesthetic goodness. Though Balfour concedes that aesthetics has a biological and evolutionary origin, for the sake of theism it makes the most sense to assert that some objects bring forth a positive aesthetic valuation simply because humanity has been designed by God to love the beautiful. In his fourth lecture, ‘Ethics and Theism’, Balfour turns from aesthetic theory to a discussion of practical actions (ethics). Though the ethical drive may be interpreted naturalistically in terms of the tension between egoism and altruism in light of genetic or evolutionary ‘fitness’, Balfour concludes that the pursuit of right action can only be a by-product of evolution, and not the goal of evolution as such. Though well aware of the claims made for ethics by Naturalism and evolution, Balfour proffers a ‘denaturalised’ ethics which fixes ethical norms within the Divine example of selfless moral behaviour. Morality, according to Balfour, is at the pinnacle of the ‘ethical scale’ and reflects actions oriented towards ultimate ends. His fifth lecture is an introduction to intellectual values, a topic covered fully in lectures 6–9. Here, he asks after the causes of knowledge and attempts to call into question the naturalistic understanding of knowledge as it relates to the validity of knowledge. 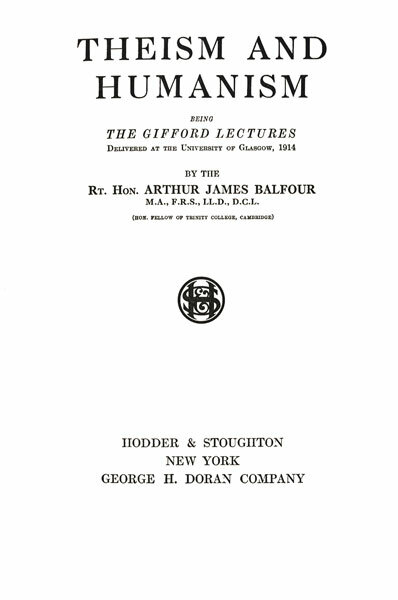 Lecture 6, ‘Perception, Common Sense, and Science’, begins by defending the foundations of a common sense philosophy, which is defined by Balfour as (a) the belief in the existence of the world as it is observed by the observing subject, and (b) the belief that this observation is consistent amongst all people who have the same or similar perceptive abilities. From this, Balfour asserts, it follows that science itself is an ‘extension’ of common sense, inasmuch as it discerns between objects as they are and objects as they appear to be. Yet, the scientific belief in an external world is only a postulate and not a provable fact. To ascertain the validity of the assertions made about the external world by the sciences, Balfour appeals to the topic of his seventh lecture, the problem of ‘Probability, Calculable, and Intuitive knowledge'. Here, Balfour defends what he describes as his own ‘heretical’ understanding of probability, which in contrast to mathematic probability arrives at certainty through ‘incomplete’ knowledge. This of course has great bearing on the problem of theism—one’s assertions about the existence of God are always statements of probability which are based on incomplete knowledge. In Lecture 8, ‘Uniformity and Causation’, the problem of one’s immediate experience of the world, discussed earlier with reference to both common sense perceptions and probability, is discussed with respect to the universal inevitability of causation. This belief is central to Balfour’s understanding of the orderly construction of the universe, which when examined repeatedly and closely, yields increasingly more consistent and systemic characteristics. For Balfour, ‘anomalies vanish as knowledge grows…’ (p. 198). In his final substantive lecture, ‘Tendencies of Scientific Belief’, Balfour surveys changing attitudes to scientific theory, with respect to atomism, the conservation of energy, the conservation of matter, and the notion of persistence. He comments on how these changing dispositions reflect what amounts to an application of inspired yet reasoned intuition, where the Divine provides the observer with an increasingly refined understanding of the cosmos. Balfour concludes his course of lectures with a lengthy summary of the course, and with a final defence for the intelligibility of theism and the fallacious reasoning which undergirds pure Naturalism. His conclusion comes to a fevered pitch, as Balfour calls for the sciences to recognise the activity of the Divine within the cosmos and within one’s perceptions of the world. God, he argues, is ‘himself the condition of scientific knowledge,’ and ‘we must hold that reason and the works of reason have their source in God.’ Scientists, he argues, ‘draw their inspiration’ from God, and their failure to acknowledge the divine origin of their thought acts to ‘proclaim their own insufficiency’ (p. 274).